I saw a posting on Facebook yesterday in reaction to the Boston bombings: “When will the violence end?” My answer: never, or at least not in our lifetimes. Hate to be so morbid about it. That posting stuck in my mind for a while, and later last night I drew a connection to a movie in which terrorist attacks are a de facto part of everyday life which everyone accepts and deals with the best they can: Brazil. In Brazil, our hero Sam Lowry is eating dinner with his mother and a fixed-up date in a posh gourmet restaurant — though the quality of their gastronomic indulgence might be questioned as they are served what appears to be something like cat food, or at best baby food. In one quadrant of the restaurant an explosion goes off, and the dining party complains briefly but then go on with their repast as the four-piece orchestra resumes play and wait staff bring in a partition so as to reduce their exposure to the casualties. This scene is a good and typical example of the way in which Brazil is a masterpiece of the highest order. 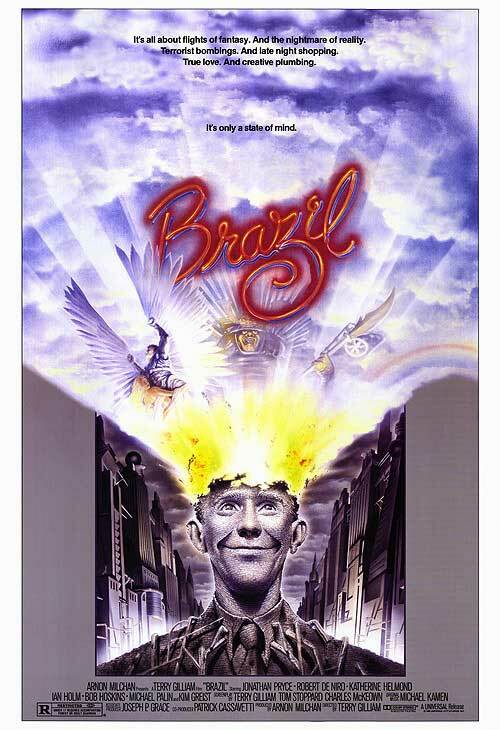 TERRY GILLIAM’S ”Brazil,” a jaunty, wittily observed vision of an extremely bleak future, is a superb example of the power of comedy to underscore serious ideas, even solemn ones. Brazil is a gorgeous, exceptionally rich film, a great cinematic masterpiece. It is the magnum opus of director Terry Gilliam from the Monty Python school. I had become certain that it was a version of Orwell’s 1984, but I’ve read that the writers did not have that in mind at all. There are enough differences, but the over-arching storyline is identical as far as I am concerned. This film, as I said, is rich – a visual feast. Humor runs throughout the film, and not generally dark, but more farcical. The comedy plays in complementary relief to the more serious tones of the film, which surround a great, romantic, compelling story. That story, very briefly, involves our hapless hero Sam Lowry (Pryce), a bureaucrat stuck in the midst of one of the several ministries which comprise the giant overbearing government. On a field trip to return a payment to a citizen, he catches a glimpse of a girl, becomes enraptured, and the romance begins. At the same time he becomes snarled up, literally, in the government tangles that he has shown to be adept at managing. As I said, the general storyline follows 1984, but less the hopeless oppression and with enough differences to keep you wondering what will develop next. This entry was posted in Movies and tagged Brazil, current events, De Niro, dystopia, essentials, satire, terror, terrorism, Terry Gilliam, topical. Bookmark the permalink.